Let us help you Get the Picture at your home, business, farm or industrial setting. 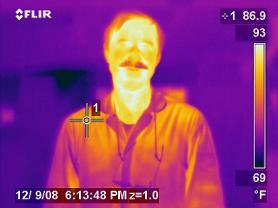 There are a variety of ways in which Freedom IR Thermal Imaging can be a great help to our clients. We provide Certified Thermal Imaging for home, farm, business and industry. We specialize in electrical, mechanical, equine, building and home energy audits. Take a look around our website and learn more about what FreedomIR Thermal Imaging can do for you. Let us help you Get the Picture. We will provide certified professional infrared thermography to our customers. We use a FLIR model 65HS infracam to insure a high resolution, high quality thermal image for our customers use. Our inspections will be performed according to existing industry standards as published by the Infraspection Institute. Our goal is to meet or exceed these respected industry standards to ensure that our customers receive the best possible service, in a timely manner, for a reasonable fee.